A confession. Public speaking scares me half to death. When I was 12 I wanted to be a graﬃti artist. Nuff was my tag. Just kinda…stuck. When I’m not Nuff, I’m also sometimes David. Like many of you here, I draw rectangles. Over the last year or so I’ve been making installations, both more algorithmic/interactive and static. Shard in particular was kind of a real departure—it’s an LED “ice” crystal that uses sensors and microphones to react to energy around it and transform that into light patterns. ...but I think once you’re in a “collective” that’s kind of game over. This is a piece I worked on with my collaborator/friend Sergio. I think a lot of my thoughts around exploration come from moving a lot when I was younger. I currently live in Toronto where I am learning important Canadian things, like the identity of our Prime Minister. This is my map of the discomfort zone—I feel like conventional wisdom says “stay in the green and profit!”, but the vast expanse of red is so…interesting. Satsuko van Antwerp refers to this as “exploitation vs exploration”. The industry seems to be at this moment where we can all go in so many different directions, and who knows what’s coming next? That can lead to a lot of fear. As someone who has tried a lot of different things so far, from photography to animation to CSS, I know each time I’m incredibly afraid. Afraid of the unknown, of sucking, of starting. This is part of the brief I got for my first installation project. Alongside aesthetic and experiential considerations, we also had to keep this thing alive through a Canadian winter. If I’m being totally honest I have no idea where to begin with something like this. I don’t even have a design education! I studied Computer Science for two years before switching to Modern Languages. The only formation I’ve had when it comes to making art is charcoal drawing. So how do you do something you can’t do? Begin with what you can do. For me that means things like research—in this case, going to museums to learn about crystals. The harder we push, the more we open ourselves up to burning out. I’ve looked for words to explain what this feels like, but it’s easier to show you. I advise avoiding burnout altogether if at all possible. One of the darkest periods in my life was a few years ago when I just lost all desire to do anything. Thankfully I’m on the mend now. I think the antidote to burnout is creative play—allowing yourself to get excited about stuff again. That’s what I needed to do. Finding the fun in what we do, because what we do is pretty great. Hakim El-Hattab (@HAKIMEL) calls this “Meaningful Pointlessness”—finding little fun things to do to get him through the slog of…less fun things. For example, while working on his documentation for Slides, he built this crazy navigation snake indicator thingy. For me, I found creative play on this project—figuring out a fun way to link the hoarding to the street but also say something about my rapidly gentrifying neighbourhood got me out of my head long enough to finally make something again. This isn’t news, but I think collaboration is the best and fastest way for us to overcome our deficiencies. Not only do our different strengths amplify each other, but a collaborator can bring out sides of us we weren’t even aware of. Take my friends Nathaly and Sergio, an engineer and a sound designer. At every point in this project when I was ready to throw in the towel, they came through massively. Figuring out electronics, fixing bugs…you name it. We were still struggling to build the thing with the budget we had, until someone introduced us to Cory, who builds props for theatre. Cory was able to fabricate our piece, to spec, with his bare hands. Collaboration can be a double-edged sword. Our project was a hit, lasted all winter, we did some TV/media interviews and Sergio and I even got to walk in slow motion in this cool video. I should have been nothing but overjoyed at this point. Instead, I got caught up in impostor syndrome. I couldn’t help but think I hadn’t done enough. That all these other people were so much better than me and I was of no use. This, of course, is nonsense. We’re here to make things happen. However you do that, and whoever is involved, it’s valid. Complexity demands collaboration. In this case, the cause is also the cure. If you have the same issues, I encourage you to keep putting yourself in collaborative environments. I think it’s really important to go wide with your learning and references, to allow different ideas from different disciplines to percolate in your mind. We looked at film, referencing both the Fortress of Solitude from Superman and the Monolith from 2001. This is a TV product we’ve been working on at Normative—I can’t say too much about it as it’s not fully released, but I want to show some of the references that went into the work we did. We learned from games, nature, the fantasy of travel…even a screensaver. I’m a big believer in working physically. Not necessarily building physical things, but using your whole physical being at work. Karl Fast’s (@KARLFAST) work in the field of embodiment, as well the extended mind theory by Andy Clark and David Chalmers, suggest that what we think of as “the mind” goes beyond the brain to include both the body and the objects and spaces around us. Think about how a kitchen becomes an extension of a chef’s abilities. We do this sometimes with post-its, but I believe there’s room for more. I’d love to see teams adopt more techniques like bodystorming and group sketching. This is our studio, in the Museum of Contemporary Art, Toronto, shared with four artists. We’re still moving in, but I’m excited to have a space to put things on the walls, get messy, prototype, and work physically. So, what are your discomfort zones? What’s your art? We often talk about Design as “problem solving”, but I find this a little reductive. (this is only half of the quote). Put that way, it starts to sound a lot like art to me. Can we marry the two? Can we see the designer as someone that elevates the mundane? If that makes you a little uncomfortable I understand. In fact in many ways, I hope it does. 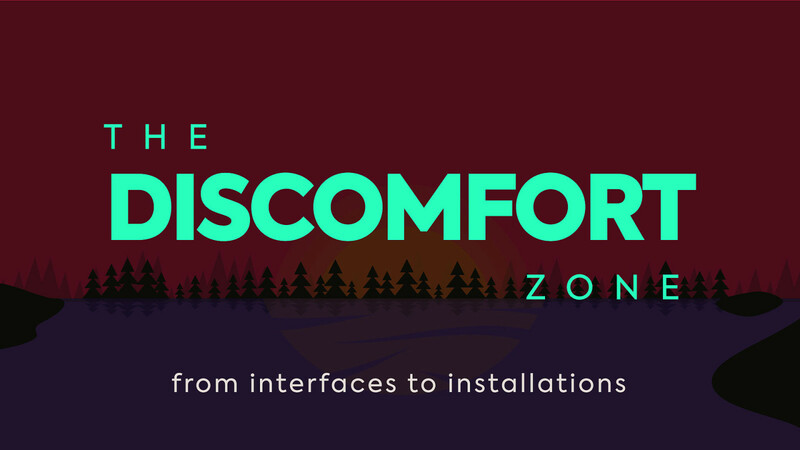 View The Discomfort Zone: From Interfaces to Installations on Notist. A short summary of my notes and thoughts on this talk. Awesome talk by @designbynuff that was exactly the kind of stuff I came here for. Look up my buddies @hundredrabbits I think you will like. "The discomfort zone: from interfaces to installations" was one of my favorite talk of the day at @canux 😍 . If you’re not in your seats clapping and ready to get your mind blown by @designbynuff then we can’t be friends anymore. ⁦@designbynuff⁩ is a fresh, interesting voice.